How to get there: See the description for Trollhetta. 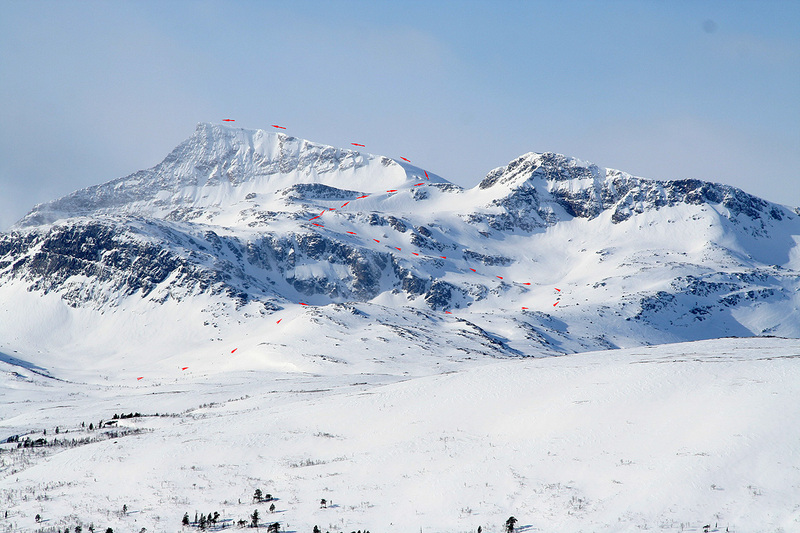 Route description: From Trollheimshytta, this mountain is an obvious target. 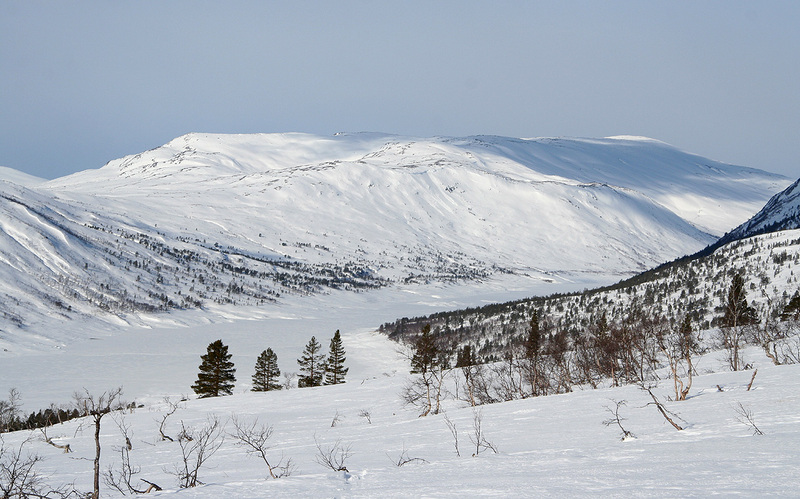 Head across the flat basin, cross the river Folda and head up slightly south (left) of Bossvasshøgda (815m). Set your course for the small knoll that extends to the right (north) of a distinct cliff band. There is no reason to gain elevation early as there are a few small valleys with ridgelines between them that you then must cross. The rest of the route is well described on a picture below. First, up a nice slope to elevation 1020, there are a few small ponds here. The summer route makes a sharp left turn, while a good skiing route crosses the small ponds and then makes a big ascending left arc to location N62:51.581, E009:06.387, elevation 1156 meter. There is a large rock here resting on smaller ones, thus making some open air below it. From this point, a pretty obvious ramp extends south. The terrain is in fact, much easier than how it may appear from below. Continue to the ridgeline where this route again meets the summer route. Make another 90 degree turn to the right and follow another gentle ramp up to the flat plateau at location N62:51.281, E009:06.433, elevation 1330 meter. The next slope is again quite gentle and takes you up to the main col between Snota and its north summit (1562m). Finally, follow the broad ridge up to the Snota summit. Comments/Trip report: I started out early, at 0645 I was skiing across the first river. Snota was in full view, but the weather was overcast, no blue sky could be seen. Skiing was easy, despite all the new snow that had fallen yesterday. I made good progress and arrived at the base of the first cliffs in a bit more than two hours. Unfortunately, just as I arrived into the more interesting and steeper part of the mountain, the clouds descended upon me and reduced visibility significantly. I could still make out a possible route above some cliffs, how steep or wide was impossible to see. I realized that I could face white-out conditions on descent and therefore took a rather dense and careful set of waypoints. My GPS had lost all its map information when I changed batteries early on the first day of the trip, this made things a bit more interesting. I did not notice the fact that the GPS memory had come loose (thus this problem could have been fixed easily) until after my return to Bergen. The climb was easier than I had expected, but the weather got steadily worse. 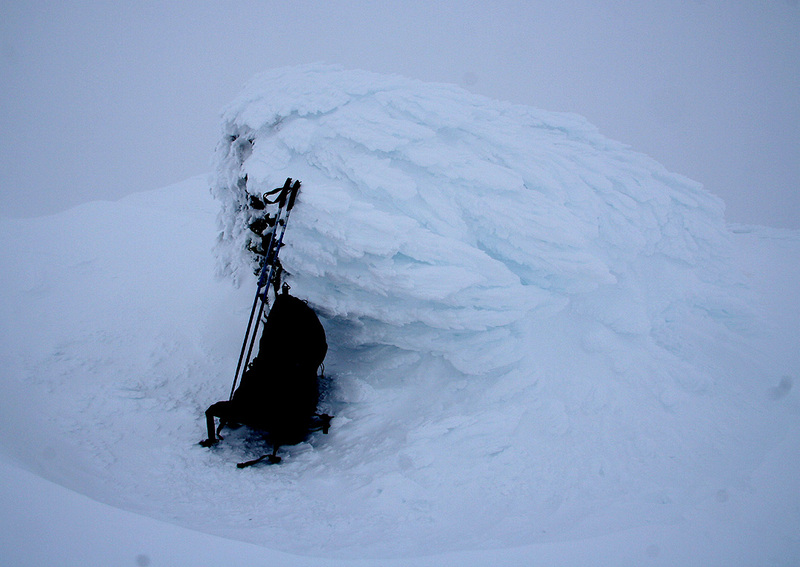 Stronger wind picked up and when I again encountered ice on the final ridge, I quickly decided to make the very last leg on foot with crampons. This time, I had a short walk to the cairn, arriving there at 1110, about 4.5 hours. The summit was rather unhospitable and I hurried back down. From the small ponds, I took a compass bearing north-east and crossed near lake Svartvatnet (889m), before going more north. By now, visibility was zero, completely white everywhere and thus a bit difficult to judge if the terrain was flat or sloping. My navigation was right on the money, a long nice slope got me down to the broad saddle south of Tindfjellet, then further down to the lake only one kilometer from the dam (picture from two days earlier). I was back at my car at 1400, about 7 hours and very interesting route finding to the summit that captured my attention for most of the first day. 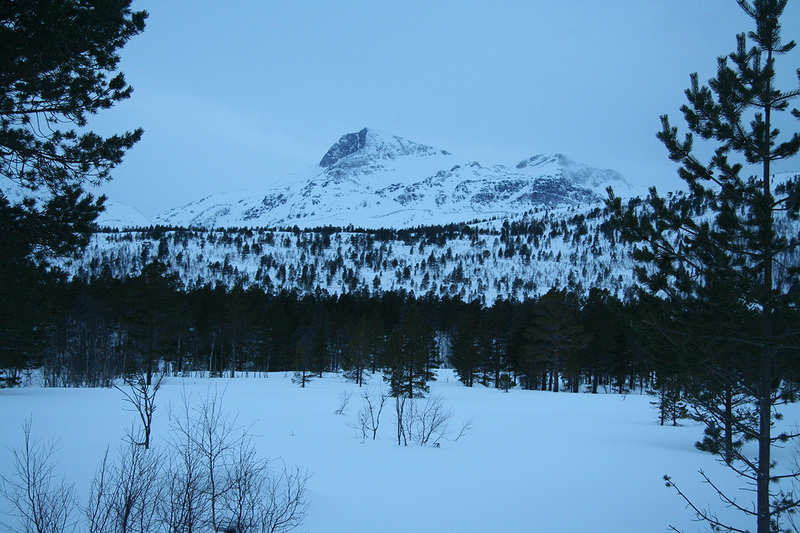 Snota, as seen from Trollheimshytta. The time is just before 0700, as I start out to climb the peak. The route of ascent (ski) on Snota. The summit cairn. Near white-out conditions.